On Thursday I measured my hair and indeed it was long enough to donate. I called a couple of salons and they would only donate to one specific charity that had a longer requirement than I was willing and really able to give at this time. So...I had to take it into my own hands. :) I tied off sections with rubber bands, then measured and cut. 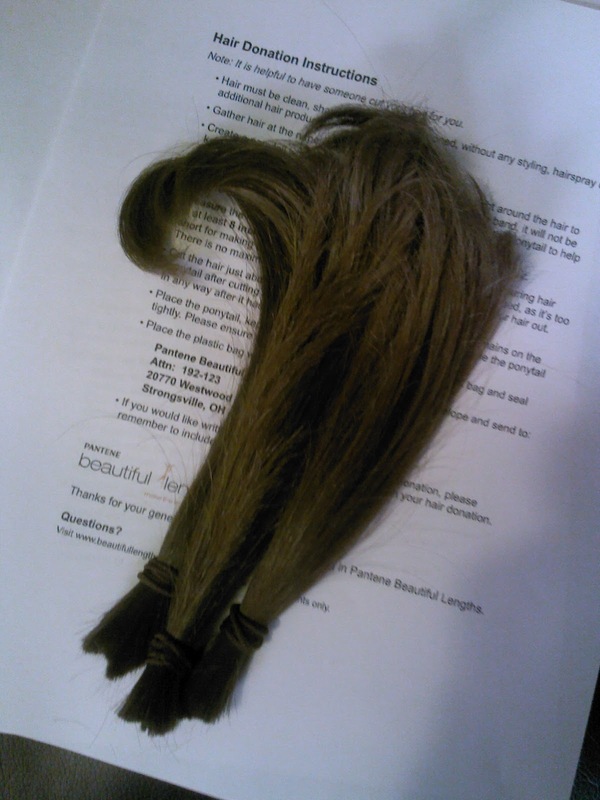 I ended up getting about 9" to donate to Pantene Beautiful Lengths. The requirement for them was 8" and I went a little over in case I hadn't measured right or something. I placed the ponies in a ziploc, then in a padded envelope and sent it on its merry way. I know it won't cure someone's cancer, but it will help provide a hair piece for someone which is super neat in my book! I did go to a professional to actually get my actual haircut after I chopped these off. It's pretty short now, but I think I'm going to dig it. :) Especially because it's for a good cause. Hello! You can now purchase (at a discounted right now!!!) my 2013 year in NC through my eyes Calendar! 1. Saute onion, garlic, poblano pepper and chicken, until the chicken has no more pink. 2. Add beans, milk and water bring to boil. Immediately turn to simmer once it's boiled. 3. Add salt, ground pepper, chili powder and taco/smokey seasoning then stir to combine. Simmer for 30 minutes. 4. Mix corn starch with a little water to make paste and stir into chili. 5. Slowly stir in shredded cheese until melted and combined. Serve immediately or let simmer until ready to serve. Enjoy! 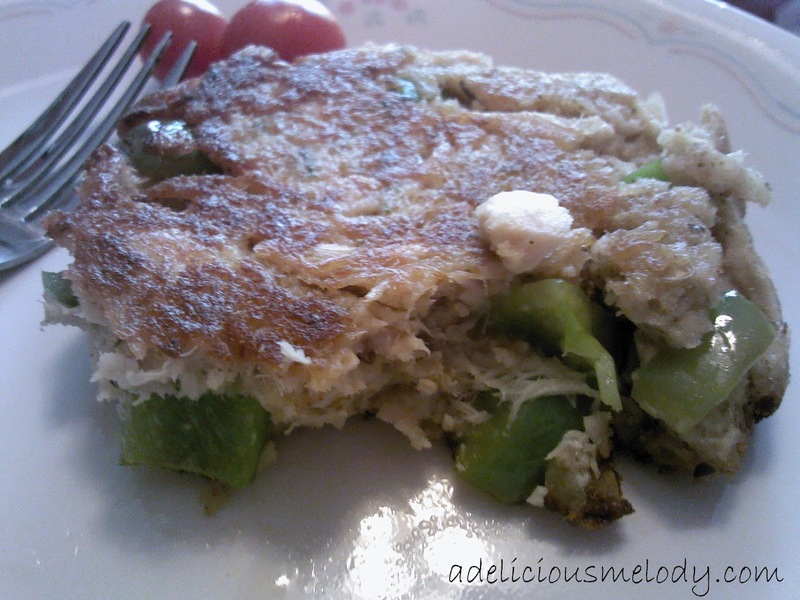 Here's a quick, easy and delicious recipe for Tuna Cakes. Small Can of Tuna yields 3 good sized Tuna Cakes. Easy to double or triple. 2. Mix together the egg and water. Add in tuna, bread crumbs and veggies then mix until well combined. It will be fall apart. 3. Make "cake like" (thick) patties and place in the heated oil. Cook each side until golden brown. Be sure to be careful with the hot oil. Turn the cakes very slowly and carefully. Serve with salad, or other sides. Enjoy! So, one friends/co-workers just got her US Citizenship this week. She's from New Zealand, but has been in the US for about 10 years now. She lived in the New England for a while, met her (now) hubby and then he was transferred down to NC about a year ago. She took the test last month and just had her Citizenship Ceremony on this past Monday. So, in order to honor her huge accomplishment one of my other co-workers and I threw a little party for her. I made some very Patriotic cupcakes, and my other co-worker brought the card/gift. 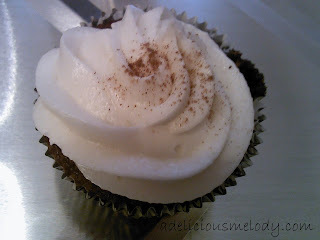 I used my favorite white cake recipe by Better Homes and Gardens, and the frosting I used on my Mexican Hot Chocolate Cupcakes but I will also post the recipes below to make it easier. 1.Allow egg whites to stand at room temperature for 30 minutes. Meanwhile, grease and lightly flour two 9x1-1/2-inch or 8x1-1/2-inch round cake pans or grease one 13x9x2-inch baking pan; set the pan(s) aside. In a medium bowl stir together flour, baking powder, baking soda, and salt; set aside. 2.Preheat oven to 350 degrees F. In a large mixing bowl beat butter with an electric mixer on medium to high speed for 30 seconds. Add sugar and vanilla; beat until well combined. Add egg whites 1 at a time, beating well after each addition. Alternately add flour mixture and buttermilk to butter mixture, beating on low speed after each addition just until combined. Spread batter into the prepared pan(s). 3.Bake for 20 to 25 minutes for 9-inch pans, 30 to 35 minutes for 8-inch pans or 13x9-inch pan, or until a wooden toothpick inserted near centers comes out clean. Cool cake layers in pans on wire racks for 10 minutes. Remove cake layers from pans. Cool thoroughly on racks. Or, place 13x9x2-inch cake in pan on a wire rack; cool thoroughly. Frost with desired frosting. 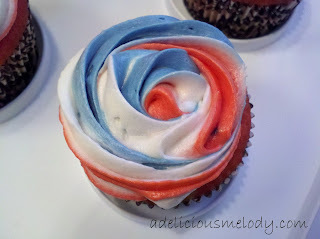 Instructions for Frosting--whip together water and shortening until fluffy. Add in vanilla and 2 c. Powdered Sugar until combined. Add milk and mix thoroughly. Mix in more powdered sugar until it is to your desired consistency I usually use 3.5c. of powdered sugar in this recipe. 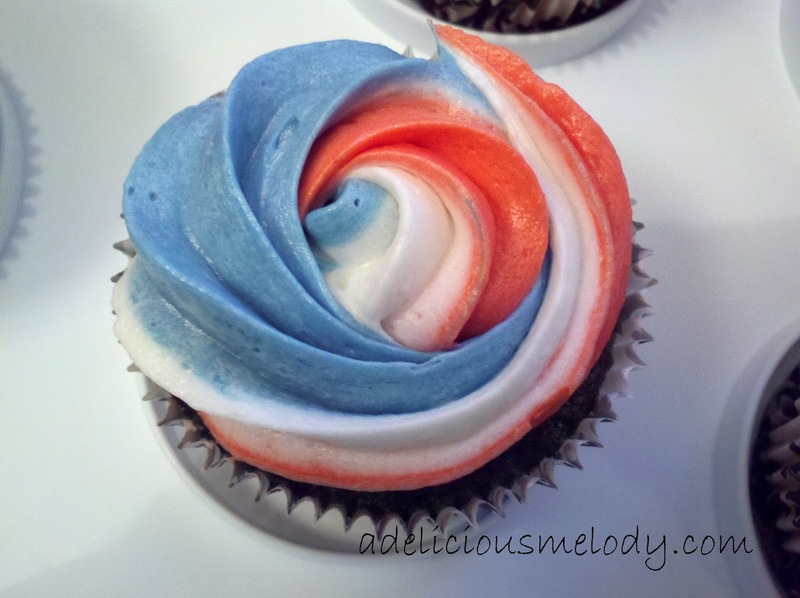 Once the cupcakes were baked and cooled, I frosted them using a technique I first learned about on Our Best Bites here. They only ever did it with two colors tho but i just thought it had to work with three so I did it! :) It worked perfectly. It's kind of wasteful is the only prob...but easy to clean up which is a plus. After you make the frosting split into thirds and refrigerate for about 30 minutes. Then keep one white, then tint one red and one blue. I use paste coloring because it's easier to get a more vivid color, tastes better (to me at least), mixes in easier and doesn't change the consistency of the frosting. But work with whatever you prefer or have on hand! 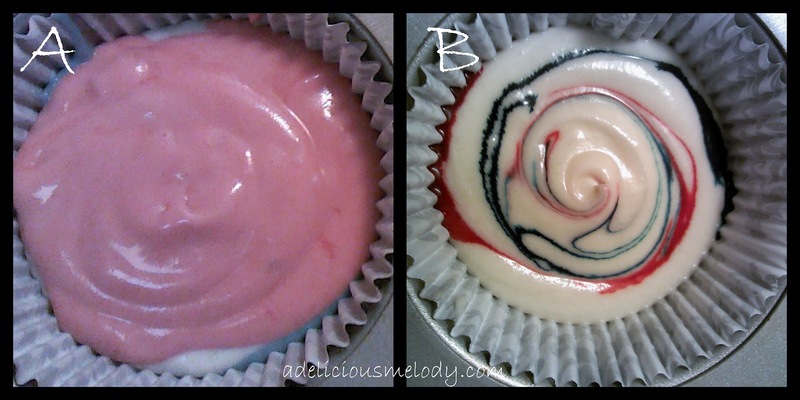 :) I used "rose" for the red and "cornflower" for the blue and I really like the way it turned out. Another cupcake....love the way the colors are a little different each swirl that comes out! Anyway, happy Independence day! or Citizenship day! or Patriotic day! or Memorial day! :) God bless the USA! Our Adult Sunday School class had a get together last night and it was fiesta themed. So I had the perfect dessert idea for it, Mexican Hot Chocolate Cupcakes! I really enjoyed the way they turned out too. (Which is always a plus.) I went ahead and made a regular batch (~26 cupcakes) and sent half with the hubby for his co-workers, and took the other half to our dinner. I tweaked Better Homes and Gardens Chocolate Cake recipe and then also put a Mexican twist on it. 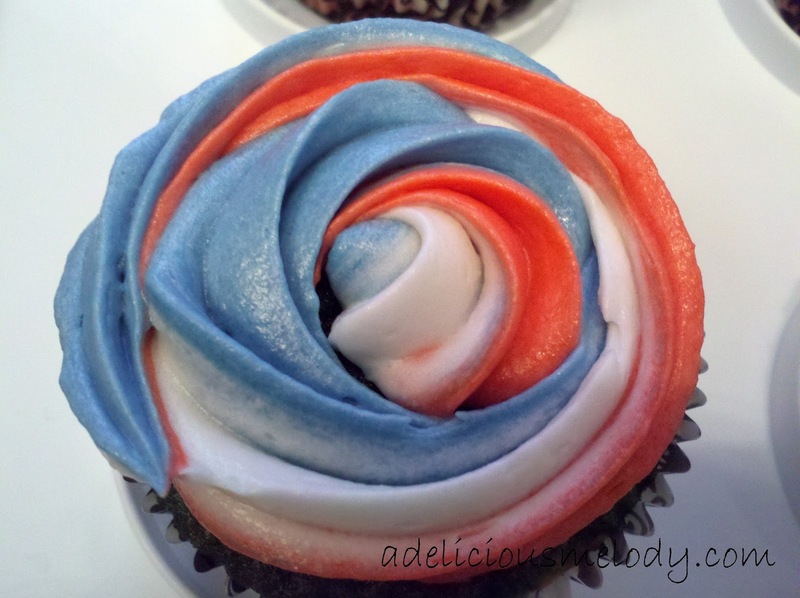 For cupcakes beat together shortening and sugar until combined. Add in baking powder, baking soda, salt and eggs until combined. Then mix in vanilla, melted chocolate, cocoa powder and cinnamon until combined. 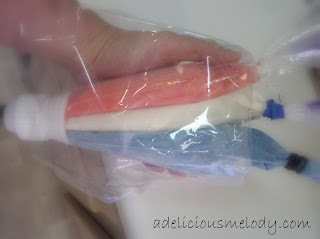 Finally, alternate mixing in flour and water until all combined. Bake cupcakes for 20 minutes at 350 degrees or the cake/s for 30 minutes at 350 degrees.